Go backWhich Swimsuit Suits My Body Shape? 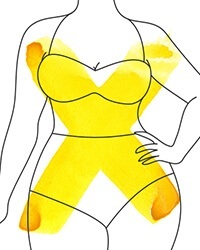 Match Amoena swimwear to your body type: Are you an A, O, V, or X shape? Find out, then find your best match! Rarely do we show our figures off as much as when we are in a swimsuit. But whatever your bust, tummy or hip size, feeling comfortable in a swimsuit doesn’t mean you must have a well-toned body – just the right swimsuit style! 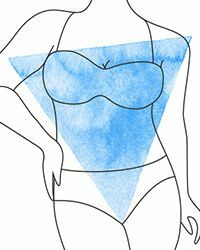 Here we discuss the four most typical body shapes and which swimwear style is the most flattering for each. Your upper body is narrower than your hips and thighs. 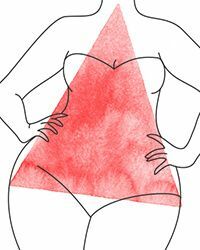 Some people call this body type a triangle or pear shape. Which swimwear styles suit the A body shape? Look for swimsuits and tankinis in bright colours to emphasize your upper body, along with eye-catching patterns or detailing on the top half. If you prefer bikinis the more subtle the better, so look for designs in just one colour. Amoena recommends: If you are an A-shape consider the one-colour Cocos bikini or a loose-fitting tankini top such as the Ayon. If the middle of your body (your waist and chest), is a bit fuller, and your legs are quite slim, you are an O shape, also known as an apple. Which swimwear styles suit the O body shape? A one-piece swimsuit will elongate your upper body visually, and design features like vertical stripes, dark colours and slight gathers or draping on the sides, could look great on you. A tankini is also a good choice if you are an O body shape. If you like the support of full bra cup coverage, consider a swimsuit or bikini top with wide straps or a tankini with a triangle or halter neck top. 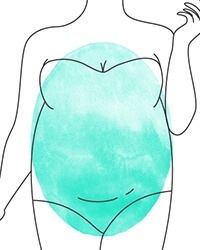 Tip: If you feel a little self-conscious about your tummy you could try a swimsuit with a shaping effect control panel, or perhaps tie a sarong around your hips. Amoena recommends: If you are an O-shape consider the Ayon Half Bodice Swimsuit. If you have wide shoulders, a full bust, narrow hips and waist, and slender legs you are probably a V body shape – also referred to as an inverted triangle. Which swimwear styles suit the V body shape? To even things out a bit, focus on your bottom half. When you accentuate your hips with patterns, bold colours or ruffles, you make them look a little wider and more balanced with your shoulders. Bikini bottoms which are tied at the sides, and swimdresses, could look great on you too. Amoena recommends: The smooth lines of the Ayon Sarong will skim over your waist and hips to highlight your beautiful shape. You are evenly proportioned with a narrow waist. Your body shape is more commonly referred to as an hourglass. Which swimwear styles suit the X body shape? Almost any swimsuit style will work for you but particularly designs that emphasize your waist and can give your bust sufficient support. You could consider highlighting your hourglass figure even more with a swimdress or a bikini that has a high-waist — both are particularly flattering. Amoena recommends: The hard part for X shaped bodies is choosing! We especially like our brightly coloured one-piece swimsuits, swimdresses and tankini sets. One of our favourite ways to support you is with good information. Read our latest magazine issue. Amoena is committed to sustainability and ensures that working conditions abroad meet German standards. Sign up to our newsletter, you'll receive advance notice of our product launches, and special offers that are tailored just for you.